We’re producing more accurate forecasts with SkuBrain and therefore making better decisions with far less manual work. 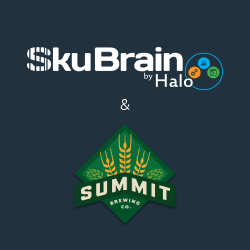 Halo, a leading provider of data integration and analytics software for supply chain planning, announced today that Summit Brewing Company has licensed Halo’s SkuBrain solution to automatically import VIP depletions and improve the speed and accuracy of the brewery’s sales and production forecasting. SkuBrain delivers demand forecasting, inventory optimization, and replenishment planning for small to mid-size beverage suppliers and distributors. “Summit had reached the point where automated and more accurate forecasting was essential for the next phase of profitable growth, but to build broad-based internal enthusiasm they decided to start with modest-yet-meaningful goals and demonstrate quick success. SkuBrain was the perfect choice,” said Keith Peterson, President and CEO, Halo. With SkuBrain in place, Summit can now automate the intake of VIP depletion data feeds and quickly adjust forecasts based on promotional activity. “We couldn’t run this business ‘in our heads’ any longer. SkuBrain is the perfect starting point for Summit. We’re producing more accurate forecasts and therefore making better decisions with far less manual work,” said Stuart Johnson, Director of Planning, Fulfillment and Systems, Summit Brewing Company.